As a homeschooling parent, I’m sure you have noticed the same problem I have. Time goes by so so fast and homeschool life is so full. Without a way to structure and record the day, I am left feeling unproductive and I miss all of the important little things that make the homeschool life worth it. This is where my homeschool bullet journal comes in. 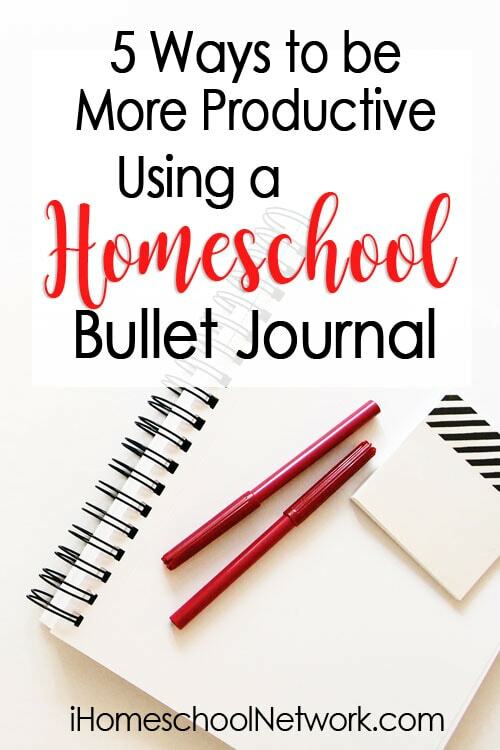 What follows is a list of pages and tricks I have found to be a more productive homeschooling parent and to capture all of the moments. You don’t have to have a bullet journal to use these ideas. Any notebook or planner would work, in fact, some of these ideas have links to printables. Wouldn’t it be lovely to end the day and know what you worked on was what needed to be worked on, even if it wasn’t what was in the plan. The feeling of accomplishment after a good days work. It will be impossible for you to be productive if you are bogged down by all the things. Replay the last hour in your head. How many decisions did you have to make. If it’s anything like my day, it feels like a million. And if I haven’t been writing the things that need to get done, my brain will randomly shoot them at me. I need to finish making lunch and then we will get started on math and dang it, I still need to pay the power bill. Then later, while teaching math, I’m also thinking about the stupid power bill. All the things need to be written down. I can’t use my Bullet Journal to write down all the things. It feels like ‘scrap’ thoughts and so I use a regular notebook. Plus it’s really nice being able to look at the list and my Bullet Journal at the same time. Oh, and to be able to put the messy notebook away and only look at the clean Bullet Journal. If I was less of a weirdo, I would just turn the page of my Bullet Journal and start writing a list. This is called a Brain Dump. If you’re not doing it, you need to. Check out Mystie Winkler’s free brain dump guide for more info. Your brain can’t hold it all. Do a Brain Dump. One of the terrible pitfalls I constantly put myself in is putting too many things in the to-do list. To combat that, I make my project box small. I also wait until after Monday is mostly over to decide what goes in that project list. If I had a terrible Monday, I might not write any! I know, shocking. Some weeks are like that and for some reason Monday normally clues me in to what kind of week it’s going to be. I also make each daily box small. I don’t want to overload on projects, and I also don’t want to overload on tons of little tasks and exhaust myself. If you can only write a small handful of to do’s on your list, you’re going to start being really picky about what goes on there. Soon you will find several things that used to be important suddenly don’t matter. Keep your projects and task amounts small. In my Bullet Journal I make a section for each one. As the week progresses, I will reflect on the week. I don’t do it every day. Some people have a time set in their day that they reflect. I’m a bit more random. I normally reflect when things are going really bad or really good. I rarely have a week where I am not struggling with something. Aside from brainstorming strategies (which has brought rough weeks to some semblance of peace) there is also the added benefit of looking back. Sometimes I am so frustrated and I can’t see passed my frustration but I remember that there was another week like this a few months ago. So, back I flip looking for that horrible week. It’s easy to find because the struggles box will be overflowing. Lo and behold, strategies! I also might write a short note about how long it took for a strategy to start working. Sometimes all of my strategies fall flat and I might write down something to try if it’s still a problem next week. A happy week is a productive week. Reflect regularly. I use sticky notes to block out the distracting sections (you know, the projects list that gets overwhelming) so that I can focus on just what I am doing right now. I would write down every step and mark them off as I complete them. To make the week easy to plan and yet flexible enough for family life I create simple routines that I know will be the most important things. The things that we will all cherish later in life. The parts of the day the memories are made from. When planning my homeschool year I wrote down the things that I loved about homeschooling and wanted to do more of. It included things like: games, documentaries, read-alouds, audiobooks and free writes. What is stopping me from getting these things (that i love) done? Two things: Where do they go in the day? and I am not prepared. So I wrote out a routine. Mondays are for library visits, Tuesdays are for Poetry tea times…etc. That was easy. Now the much harder part (for me anyway), I actually have to plan each thing. If I write down Documentary on Thursday, it’s not going to happen. I have to actually plan what documentary we are going to watch. When Thursday comes around, I can always change my mind and decide something else would better suit our purposes but if there is no idea there I feel decision fatigue and don’t even try. Make as much of your day routine as you can. Write specifics in your plan. Hopefully these ideas help you enjoy your homeschool day. For more ideas on how to use a Bullet Journal to capture the little moments visit my read this.